I am building a website and along the way I have come across a lot of things I didn't know about and was hoping to get some help in understanding some of them. I started building a website using Flask and the Jinja templating language. 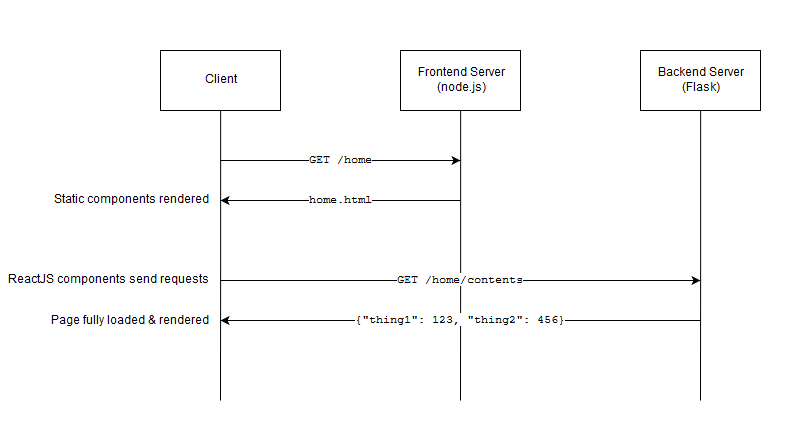 This was very intuitive and easy to understand: client makes a request, server checks all requests are good and then delivers the whole working page in one go. Assuming I am correct up to this point, my question is, how does the above diagram look in the case of submitting a form? A form requires a CSRF token to be embedded in it when it is rendered, i.e. the token is created on the Frontend Server. But then, how does the Backend verify that token? Does all authentication also need to happen on the Frontend server? I am not clear on how the Frontend and Backend fit together. provides an API for the dynamic content of the site. As there is only one server, the handling of the CSRF tokens shouldn't be an issue. For the CSRF concerns in an API using Flask you can use one of the plugins such as SeasSurf. Basically the CSRF token will be created on the back-end server and then stored in the client via a cookie that is passed on responses from that server. Then the csrf values are passed and verified in your Post requests to the back-end server within the request header. Not the answer you're looking for? Browse other questions tagged web-development node.js front-end backend flask or ask your own question. What is a correct way to exchange information between “frontend” and “backend”?